The Beijing Architecture School at Tsinghua University printed a 26.3-meter-long bridge from a concrete printer on a 3D printer, Lenta.ru reports with reference to Dezeen. It is alleged that a pedestrian bridge with a width of 3.6 meters, passing through a canal in the Baoshan area, has become the longest of its kind in the world. 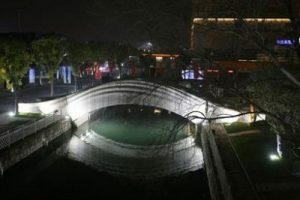 The authors of the project repeated the arched form of the oldest, 1400-year-old Chinese Anji bridge. According to the designers, printing a bridge turned out to be a third cheaper compared to traditional construction. It was possible to save due to the lack of fittings and crates. The single-arch bridge is constructed of polyethylene fiber-reinforced concrete with additives additives. It consists of 176 concrete blocks that were printed using two 3D printing systems with a robotic arm. It took 450 hours to print all the elements. A monitoring system is built into the bridge that will record the deformation of the concrete over time.